Over the years, I have produced a large number of educational courses to help people make more money. The fact is that the standard advice of working 40 hours a week and putting your savings into a 401k just doesn’t work anymore (if it ever did). People need to take their finances into their own hands, and my courses can help them to do just that. I have focused primarily on real estate and it has gone pretty well for me. So let me take this opportunity to introduce you with my flagship program the Land Profit Generator. The Land Profit Generator is about investing in vacant land, primarily in rural areas. The program teaches you how to buy land for 5% to 20% of its value and flip it in days or weeks. It also includes training videos, legal documents you can use, and tools for preparing and offer and working out a sale with seller financing. So what is the philosophy behind my system? Basically, it teaches you how to find land owners who don’t want their land anymore. This might be the case if the land was willed to them by a distant great-uncle, if they bought it to build their dream house with their sweetheart but then the romance went sour, or if they got a high-paying job across the country. Whatever the specific circumstances, some people decide that they just don’t want to keep paying the property taxes on a piece of real estate that they have no plans of using. Or maybe the property was an investment that didn’t pan out. Some people make bad investments; it’s as simple as that. They buy a piece of property for an inflated price during a boom and expect to make millions in one sale, and when they can’t find a buyer they get disillusioned; they buy a piece of retirement property but then decide to stay in their old house; they buy a property as a gift for a family member who ends up not needing it. For whatever reason, some people buy real estate with unrealistic hopes and are quick to give up when things don’t work out as expected. 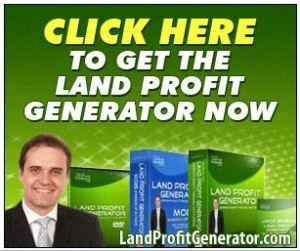 The Land Profit Generator has been around for several years and the methods it teaches have made many people (myself included) very wealthy.